How appropriate to start off the thread with that ad! It's a lot of fun. Sigh.... the show had its problems before but something seemed to break in 2003... and it got progressively worse, until we hit 2007. And, then, it was over. Thanks for starting this. That tagline for the ad always seemed tawdry to me, a weird contrast to how uber-serious the show was early on. For me the show was the characters that Bradley Bell likely had little use for - Sally, Darla, Bill Spencer (killed off for no good reason), Felicia. Characters like Taylor and Eric and Donna are one-dimensional and unfortunately so are most of the people they share story with. That and the show's inability to actually develop characters or tell stories mean that they just have to rely on stunts. I doubt I have as much as you do but I hope to post some stuff when I can find it again. My B&B favorite will always be Joanna Johnson. So regal, and pretty, yet never the typical weepy/dull soap heroine. Oh your welcome Carl I'll try to post what I have. 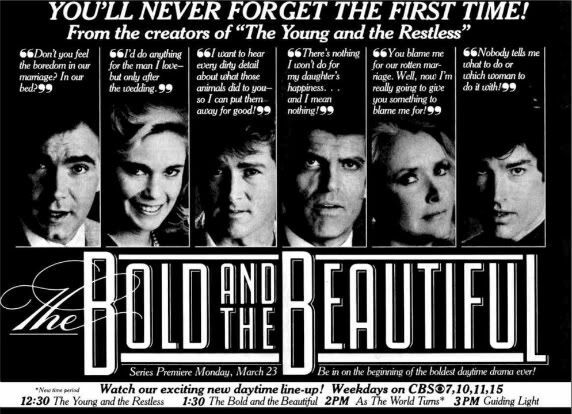 The early years of B&B fascinate me to no end. I know Joanna Johnson has had a fairly successful writing/directing/producing career in the past decade but I've always wondered how B&B would be had Caroline never died. Uber-serious is right; After seeing clips of Macy's first scenes I was shocked by how cold and distant Macy was to Sally. Sally is all thrilled that she's back in town from school but Macy only wants money. Also the "Angela Forrester" story was so creepy and bizarre, what a strange story but I must say the actress was quite good. Odd that Sally was involved when Deveney gave her sad speech on the Queen Mary. For the record, I thought the show was on fire from 2000-2003 but yeah it lost its steam due to some messy mistakes. 2005 was pretty good I thought, but after that its been all downhill. Taylor basically replaced Caroline (although I thought Taylor was a sanctimonious hypocrite from early on, which I never felt with Caroline...but then, the writing was better early on), so I guess they may have had some of the same stories. I do think Hunter Tylo's exotic beauty - she was, at one time, probably the most stunning woman on TV - helped give a real contrast to Brooke and made the eternal triangle more believable. 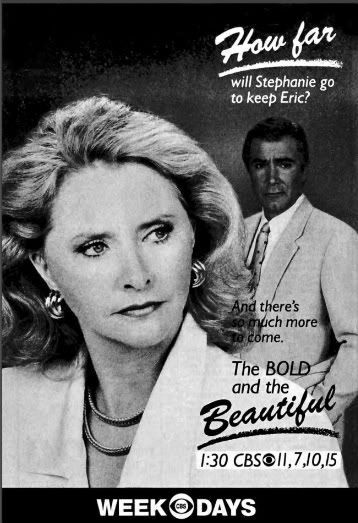 In the long run Caroline was probably a character B&B couldn't have sustained, and she was better off leaving after a few years. It's interesting how that story starts in one of the very first episodes (Stephanie gets a phone call and she says never to call her at home). I wonder if it's all online. I know the story mostly because of how much Susan Flannery hated it. She said that the line about Angela's death - "she rolled all the way down 7th Avenue" - is one she used for years any time she thought a story sucked. That awful wink is always my favorite part. The guy who played Dave was wooden but he had a presence that most of the other younger men on the show didn't have, aside from Ridge. I wonder why they let him go. In the early clips I saw, he came across VERY generic. Unlike the other men, there wasnt anything distinctive about him visually and he just didnt seem to stand out. 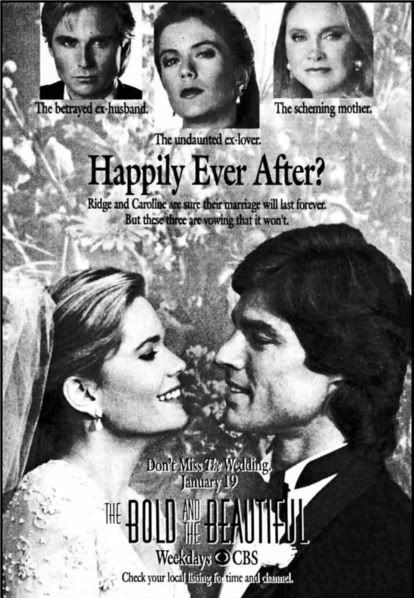 Very average and once Brooke entered Ridge's sphere, I dont see what use the show would have had for Dave. I felt that way more about Thorne and Storm. Storm, defeinetly but not Thorne for me. I thought he had potential with Caroline early on and thankfully they went there. Storm, I have no clue what they did with him before he was recast and put with Taylor. Did he even have a love interest early on or did he just babysit his sisters and gripe about his father? Those are great. I didn't realize Jeff played any of the Thorne/Caroline/Ridge story. Storm, I have no clue what they did with him before he was recast and put with Taylor. Did he even have a love interest early on or did he just babysit his sisters and gripe about his father? First Storm went out with Ridge's old flame Alex Simpson a couple of times, later he dated Kristen but she chose Clarke over him. If I remember correctly, Storm even posed as the father of Margo's baby for a short while to help Margo break up Clarke and Kristen. I think Storm also dated Felicia briefly before he was put with Taylor. But that was of course after he was recast. I only liked Storm during his last run when he was played by William DeVry. Too bad they never gave him a real story and killed him off. DeVry was a good actor (and good-looking too!). Getting rid off the Spectra clan was one of the biggest mistakes – if not even the biggest – Brad Bell could make. I understand that Sally had to be phased out since Darlene Conley had been in poor health for quite some time before her death, but they could have easily built a new Spectra generation with C.J. as the central character. Besides, they still had Clarke and Darla and could have brought back Kimberly (I might be in the minority here, but I liked Kimberly, especially once she became evil and stalked Thorne). Another missed opportunity was the SORASing of C.J.s half-brother Mark. Not only was Michael Dietz a terrible actor, I also don't understand why they chose to make Mark a doctor. For example, they could have written a story where C.J. and Mark fought for control over Spectra.